Mundial Knives - Excellence in Design & Performance - On Sale Now! Fully Forged Knives with a Lifetime Warranty! As featured on Dexter ! We guarantee you will love your new knives! Any questions, please email our Chefs! When we first tested the forged Olivier Hardwood and Mundial Future and Elegance Cutlery we were amazed at the balance of these knives. Fully forged knives are the working tools of great Chefs and Gourmet Cooks! Traditional Black 5100 Riveted Cutlery at a great price! Chef Sets and Cutlery Storage. Cool Red & White Handle Cutlery looks great in black and white kitchens! 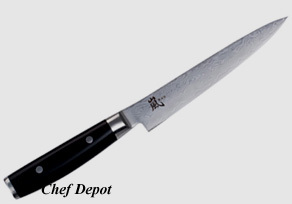 Sushi Knives and stamped Chef Knives for less. Mundial knives are consistently judged the finest in the world by professional Chefs. Comparison testing by Chef Depot, The New York Times, Good Housekeeping and Cooks Magazine gave Mundial cutlery the highest possible rating in every category - scoring higher than more expensive brands! Mundial Scissors are razor sharp and hold an edge through years of use - Lifetime Warranty! This is the 10 inch Mundial Future Chef knife. 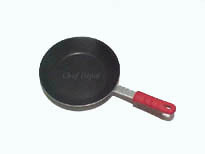 Features a stainless steel handle and sharp high carbon alloy steel blade with polished granton edge. 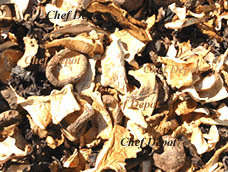 It is perfectly balanced and a great choice for most cutting and chopping preparation. Lifetime Warranty. This is in the Dexter kill kit. Buy them now, as they will sell out soon. More sizes below. More Stainless Steel Handle Knives - Click Here! 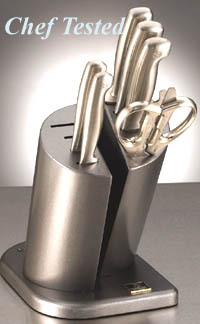 Receive a Pro Waiters Wine Opener for Free with $200.00 purchase of Cutlery ($200.00 or more)! Our professional 2 step waiters wine opener is a $20.00 value! Lifetime Warranty! Place your order today, limited time offer! The new Future 16 piece block set features the most essential pieces for everyday use. It Contains: 8 in. Chef Knife, 6 in. Chef Knife, 8 in. Bread, 8 in. Carving Knife, 2 1/2 in. Tourne knife, Carving Fork, 6 in. Wavy Edge Utility, 3 1/2 in. Paring, 10 in. Sharpening Steel, Kitchen Shears, the new 7 in. Granton Edge Santoku knife and the 8 in. Granton Edge Carving Knife, Four pieces - 4 in. Serrated Steak Knives, Hardwood Block. 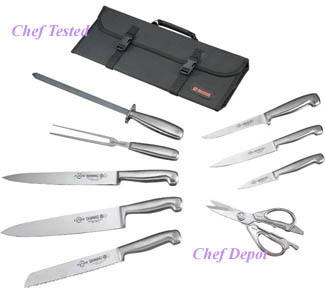 The knives are forged from German alloy steel with stainless steel welded handles. Lifetime Guarantee. 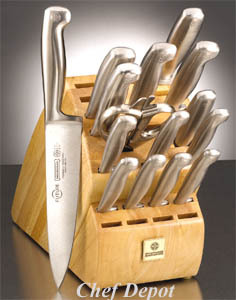 Chefs Note: A great knife set for every gourmet! This block has it all with unique wood grips! The handles have a warm comfortable feel and do not slip! The new Future 24 piece block set contains every pieces you will need for everyday cooking. It Contains: 10 in. Chef Knife, 8 in. Chef Knife, 6 in. Chef Knife, 8 in. Bread, 8 in. Carving Knife, 2 1/2 in. Tourne knife, Carving Fork, 6 in. Wavy Edge Utility, 6 in. Boning, 3 1/2 in. Paring, 10 in. Sharpening Steel, Kitchen Shears, the new 7 in. Granton Edge Santoku knife and the 8 in. Granton Edge Carving Knife, Eight pieces - 4 in. Serrated Steak Knives, Hardwood Block. 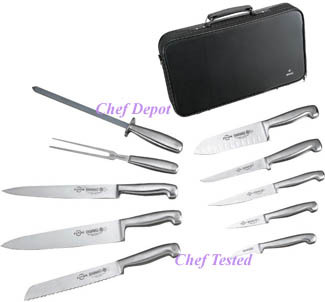 The knives are forged from German alloy steel with stainless steel welded handles. Lifetime Guarantee. 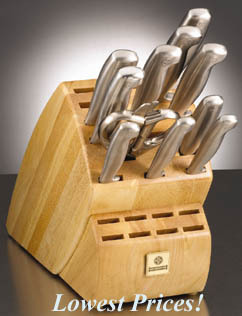 Chefs Note: A great knife set for every gourmet! This huge block has it all with unique wood grips! You will have every knife you need for all your cooking, serving and presentation! This is the Mundial Future 2 Piece Carving Set! It makes a great gift! The semi flexible carving knife has a 8 in. forged German Steel blade, the meat for is 12 inches long overall. FREE hardwood box ! long and forged from high quality German alloy steel. It is perfect carving prime rib, turkey, roasts, leg roasts and other meats, also a great knife for filleting large fish. The fork also works great for turning foods while grilling or sauteing. This is the new Mundial Future 7 pc. Knife Block Set! It includes a 8 in. Chef knife, a 8 in. Bread knife, a 6 in. serrated Utility knife, a 3 1/2 in. Paring knife, 10 in. Sharpening Steel and Kitchen Shears in an attractive Designer block. These knives have the perfect shape, balance and weight, with stainless steel welded handles, forged for a lifetime of use. These knives are beautiful, functional and easy to clean. They come with a Lifetime Warranty! Chefs Note: We like this set of cutlery! It has razor sharp edges that easily resharpen on our Diamond Knife Sharpeners! When we first tested the Mundial Future Knives, we were amazed at the lightweight and balance of these knives. They are easy to use and hold an edge longer than most other knives. The clean and smooth lines of the Future series scored the highest on sanitation and comfort of all the knives tested. This is the Mundial Future 10 pc. Knife Block Set! It includes a 7 in. Santoku knife, granton style, a 8 in. Bread knife, a 6 in. serrated Utility knife, a 3 1/2 in. Paring knife, 2 1/2 in. Peeling knife (Birds Beak/Tourne), 8 in. Carving Knife, 8 in Serrated Bread Knife, Carving Fork, 10 in. Sharpening Steel and Kitchen Shears in an attractive Hardwood block. These knives have the perfect shape, balance and weight, with stainless steel welded handles, forged for a lifetime of use. These knives are beautiful, functional and easy to clean. They come with a Lifetime Warranty! Chefs Note: Add the case below and you got the start of a Dexter kill kit. We like this set of cutlery! It has razor sharp edges that easily resharpen on our Diamond Knife Sharpeners! Chefs Note: When we first tested the Mundial Future Knives, we were amazed at the lightweight and balance of these knives. This is the new Mundial Future 12 pc. Knife Block Set! It includes a 8 in. Chef knife, a 8 in. Bread knife, a 6 in. serrated Utility knife, a 3 1/2 in. Paring knife, 2 1/2 in. Peeling knife (Birds Beak/Tourne), 7 in. Santuko Knife, 6 in. Chef Knife, 8 in. Granton Edge Carving Knife (air pockets on blade), 8 in Serrated Bread Knife, Carving Fork, 10 in. Sharpening Steel and Kitchen Shears in an attractive Hardwood block. These knives have the perfect shape, balance and weight, with stainless steel welded handles, forged for a lifetime of use. These knives are beautiful, functional and easy to clean. They come with a Lifetime Warranty! Chefs Note: We like this set of cutlery! It has razor sharp edges that easily resharpen on our Diamond Knife Sharpeners! 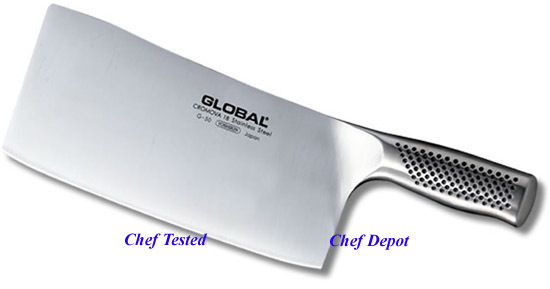 Chefs Note: When we first tested the Mundial Future Knives, we were amazed at the lightweight and balance of these knives. A great block set, you can add more Future pieces later. They are easy to use and hold an edge longer than most other knives. The clean and smooth lines of the Future series scored the highest on sanitation and comfort of all the knives tested! Our Forged Mundial Future Chef Knife Set is on sale! It includes a 10 in. Chef knife, a 7 in. Santuko with granton Edge (air pockets) a 10 in. Carving knife, a Carving Fork, 6 in. boning knife, 6 in. Utility knife, a 8 in. Bread knife, a 3 1/2 inch Paring knife, a 2 1/2 in. Birds Beak Knife, a 10 in. Sharpening Steel in a large Chef knife case (the case holds a lot more) + a digital thermometer! These knives have the perfect shape, balance and weight, forged for a lifetime of use. These Mundial Future knives (more here), are beautiful, functional and easy to clean. This exclusive set comes with a Lifetime Warranty! When we first tested the Mundial Future Knives, we were amazed at the lightweight and balance of these knives. Chefs Note: This is a perfect set for every Culinary Arts Student Chef and travelling gourmet! Could be the Dexter kill kit? The clean and smooth lines of the Future series scored the highest on sanitation and comfort of all the knives tested. Add Knife Protectors! Add a Sharpening Stone for $6.00! Our Forged Mundial Future Chef Knife Set is on sale! It includes a 10 in. Chef knife, a 10 in. Carving knife, a Carving Fork, 6 in. boning knife, 6 in. Utility knife, a 8 in. Bread knife, a 3 1/2 inch Paring knife, a 10 in. Sharpening Steel, Kitchen Scissors (twist to take apart for easy cleaning) in a large Chef knife case (the case holds more) and a Chefs 0-220 pocket thermometer! These Mundial Future knives (more here), have the perfect shape, balance and weight, forged for a lifetime of use. These knives are beautiful, functional and easy to clean. This exclusive set comes with a Lifetime Warranty! When we first tested the Mundial Future Knives, we were amazed at the lightweight and balance of these knives. 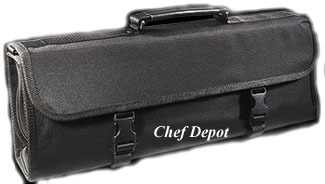 Chefs Note: This is a perfect set for every Culinary Arts Student Chef and travelling gourmet! Could be the Dexter kill kit? The clean and smooth lines of the Future series scored the highest on sanitation and comfort of all the knives tested. A knife protector set is also available below (high quality durable plastic knife protectors). This sale will end soon, we guarantee you will love this knife set! The Mundial Future 5 in. Wide Blade Steak knife set. Each wide blade knife is Forged from a bar of alloy steel, with stainless steel welded handles, designed to last for lifetime of use. This set comes in a solid rosewood, felt lined presentation gift box that looks great and it's made to last. 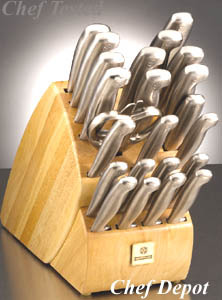 Chef Notes: This is a great set of perfectly balanced steak knives! The gift box makes it a plus for storage or a great gift! Lifetime warranty! Our new Aluminum Magnetic Knife racks look great in modern kitchens. They are made from durable high strength polished aluminum with two large heavy duty magnets. They are very powerful and easily hold knives, shears, melon ballers, garnishing tools, cake spatulas and more. They match chrome and stainless steel appliances. These very powerful magnets will help you organize drawer space and display your kitchen tools. The Future Granton Edge Chef knife is available in popular sizes below, 4 in., 6 in. and 10 in. blades. Forged from alloy steel with a series of alternate air pockets, staggered on both sides of the blade. The air pockets help to produce thinner slices and it keeps food from sticking to the blade. 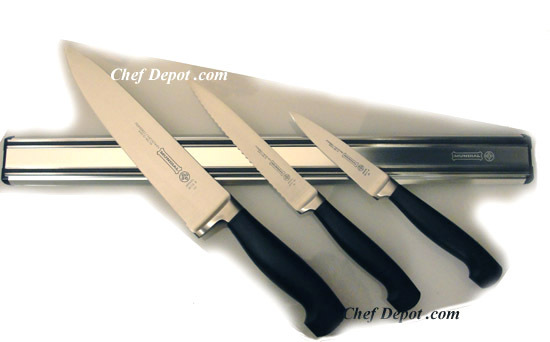 These knives feature solid stainless steel handles. These knives are very cool looking and made to last. Lifetime Guarantee. These professional knives are high quality and a better value than most forged cutlery. A great knife for everyday use cutting & chopping! The blade has a nice thin edge and the handle is superb! We love them! Chefs Note: Choose a larger blade for big hands and large cutting tasks. Choose a smaller blade for light chopping and to fit smaller hands! The granton edge and stainless handles are sweet combination. Our Forged Mundial Future Chef Knife Set is on sale! It includes a 10 in. Chef knife, a 7 in. Santuko with granton Edge (air pockets) a 10 in. Carving knife, a Carving Fork, 6 in. boning knife, 6 in. Utility knife, a 8 in. Bread knife, a 3 1/2 inch Paring knife, a 10 in. Sharpening Steel, Kitchen Scissors (twist to take apart for easy cleaning) in a large Chef knife case (the case holds a lot more) + a digital thermometer! These knives have the perfect shape, balance and weight, forged for a lifetime of use. These knives are beautiful, functional and easy to clean. When we first tested the Mundial Future Knives, we were amazed at the lightweight and balance of these knives. This is a perfect set for every Culinary Arts Student Chef and travelling gourmet! The clean and smooth lines of the Future series scored the highest on sanitation and comfort of all the knives tested. 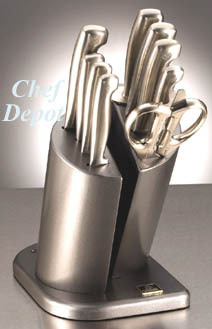 Click Here for more Chef Knife Sets! Global heavy duty stainless steel magnetic knife rack is made in Japan, a cool modern design! Extra thick and strong, weighing in at over 4 lbs, this rack features the most powerful magnets to grip the blade firmly for safe and convenient visible knife storage! This holder helps to free up precious drawer and counter space. Hold many tools too. The magnet bar easily attaches to any wall or cabinet for safe knife storage. The screws are hidden by covers on each end. Choose from 3 sizes, mounting screws included. Video below. This Amazing Knife Holder comes in a gift box. Click Here for Chefs Knife storage ideas! Mundial fully forged knives with black poly riveted handles! Mundial knives are forged from special German High Carbon Chrome Moly Alloy Steel, which holds a very sharp cutting edge for a long time. These forged knives are shaped & sharpened by hand - the whole process takes over 125 individual steps. These knives that will stand the test of time, they come with a Lifetime Warranty. More forged knives at low prices! Large quantity discounts are available. Our new small Navy Blue Knife Case is made to hold 5 + pieces of cutlery and garnishing tools. This case is very attractive with double sewn reinforced edges and handle, extra strong elastic knife supports. This soft case knife roll features 5 knife pockets that can hold up to an 18 in. knife. It seals closed on 3 sides with a commercial grade zipper and latches closed with two durable clips. It measures 19.5 in. x 5.25 in. closed. Durable 600D polyester fabric with PVC backing. Lifetime manufacturing warranty. This is the new Chefs Paring Knife! This knife has an unbreakable poly handle. 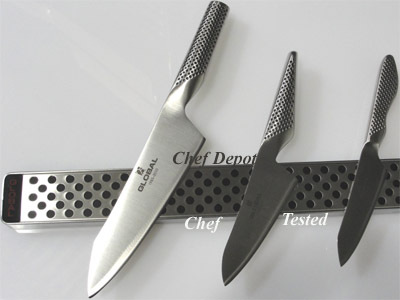 These knives have 3 1/4 inch long, thin, no stain high carbon alloy steel blades. Chefs Note: A great little paring knife that is great for most small cutting and peeling tasks. We like the large tapered handle. Lifetime Warranty! NSF certified. Click here for more Stamped Foodservice Knives! 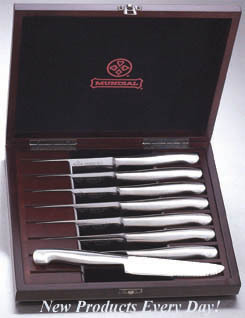 This is the new Mundial Future Carving Set. It comes in a formal presentation case and has a forged 8 inch carving knife and straight meat fork. Chefs Note: Hurry, only 1 left! We have the best prices! Lifetime Warranty. This set makes a great gift! These high heat silicone oven mitts are made to last nearly forever. They are heat proof to 600 + degrees F. and non slip. Made from a special silicone mixture they were designed to be the last pair of baking mitts you need to buy. Dishwasher safe! Sold as a set of two. Chefs Note: Many of our customers use these as non slip trivets to protect their counters and tables when serving hot food. Our tests prove that these are great trivets! This is the Mundial Future Boning Knife! It has a 6 inch semi stiff blade. 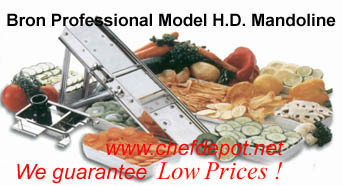 It is perfect for boning out chicken, pork, leg roasts and other meats. It also works great for filleting fish. Chefs Note: Another Dexter kill kit essential. A great knife for the price! Choose from stiff or flexible blades below! More FUTURE KNIVES, click the page links below.